Another long overdue look at the even more exclusive Midas armor. This exclusive was originally released in Asia at various conventions and also came with a t-shirt, bag, and poster (there might have been one more item). 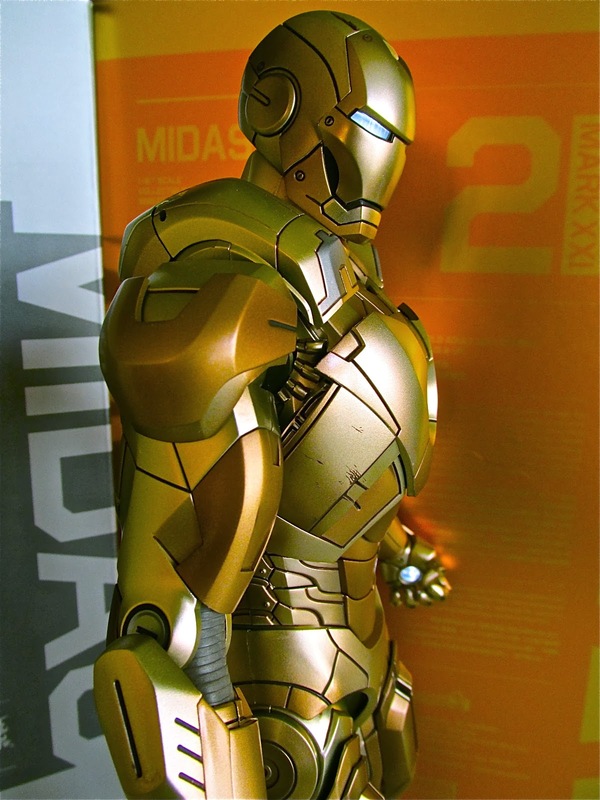 Sadly, none of those came with the release in America, but the Midas is still a great piece. 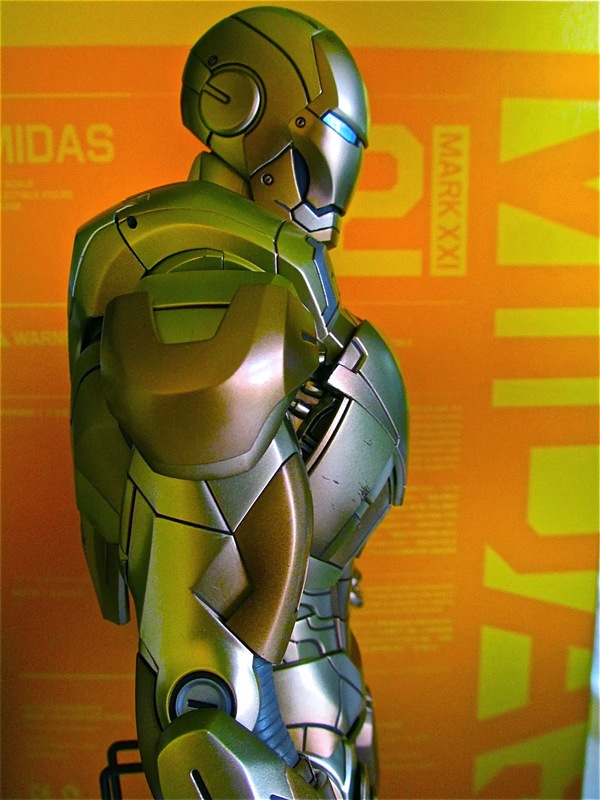 The Midas was seen in Iron Man 3 for a brief second during the House Party Protocol sequence. It is shown flying in right after Heartbreaker and Starboost make their entrance. This is a great piece to own and is actually one of the first super exclusive Hot Toy figures I have gotten. 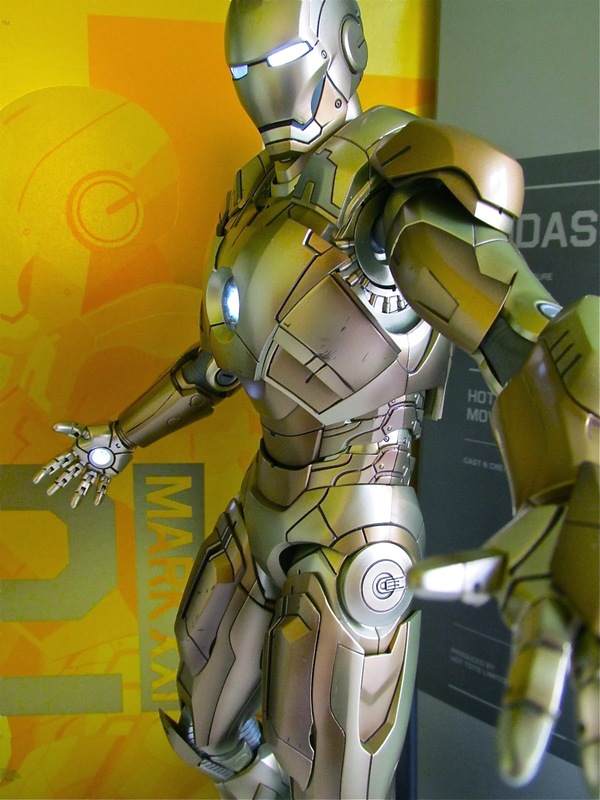 The figure itself is actually just a repaint of the Mark VII armor that was released originally from The Avengers line and for how much it sold for some might see this a huge waste. 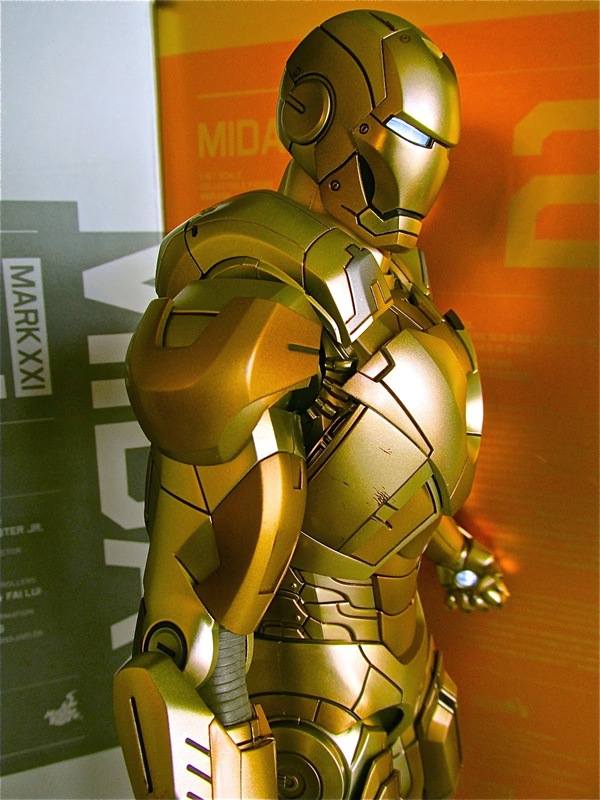 However, the gold repaint does give the armor a different look and honestly looks great with the other Iron Man armors. Another notable touch is the scratches on the armor. In true Hot Toys tradition of real life detail, this figure is made to look like it has been used and so some intentional scratches are seen on the feet and the chest area. So don’t be alarmed by this. It comes with the switch out shoulder pads, the usual set of Iron Man hands, arm rockets for both arms, and wrist gauntlets for the repulsor hand pose. A circular base made to look like the one seen in Tony’s workshop is also included. 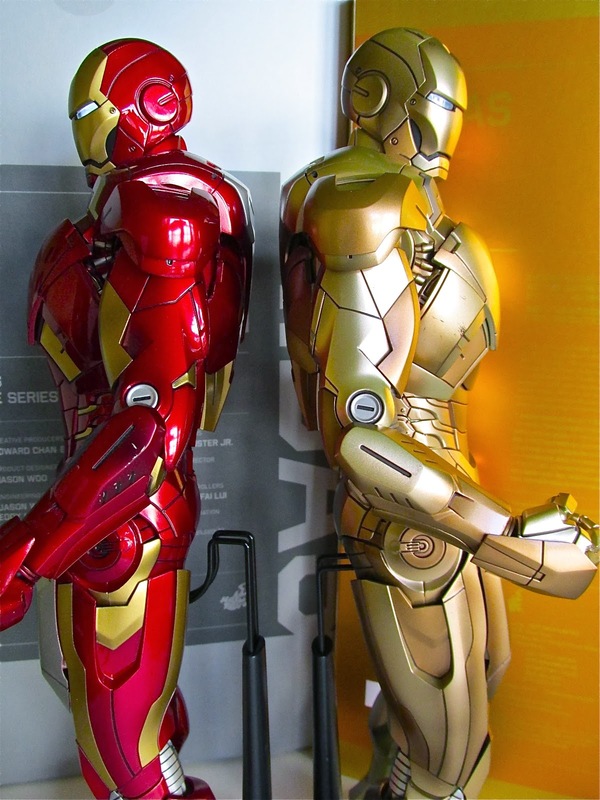 This base is actually the same design used for the base that was released for the Iron Man 3 Tony Stark Armor Testing Version. The only difference with this base is that it does not light up. There is a “battery” panel under the base, but you can’t open it. Hot Toys even notes that one cannot and should not try to open the panel. Overall, I am very pleased to add this one to my collection. 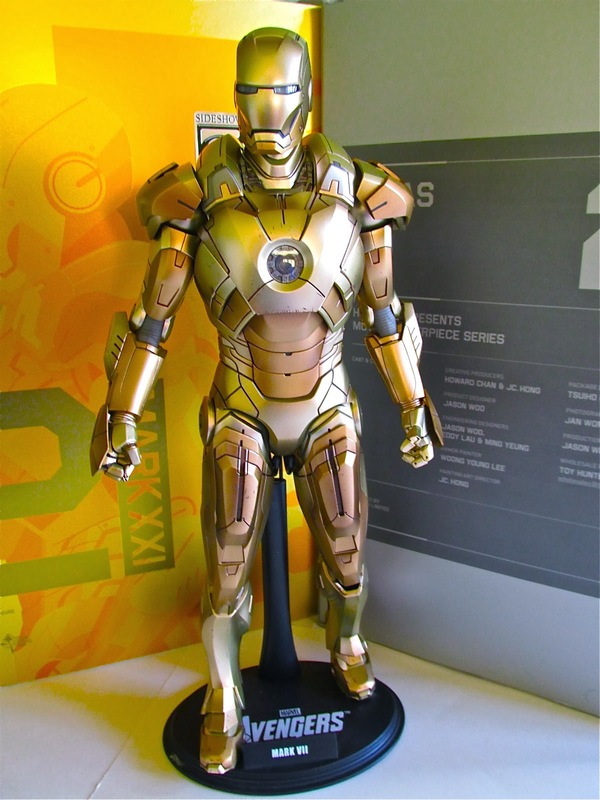 Even though this was pretty pricey, considering what little accessories it came with, it is still a worthwhile figure to own and really stands out among other Iron Man collectibles.